Click here to view Imanifold website. A revolutionary breakthrough in digital manifold technology. The iManifold® will save you hours of time. We are now offering free shipping within the Continental 48 United States. This is now our policy for the 48 continental United States. Take advantage of this offer now. When working with three phase units, we have found that adding a three phase capacitor to the unit will provided an additional 5% minimum overall savings. This has to do with line losses. Adding a capacitor to three phase units, will reduce those losses and the savings is reflected at the utility meter. We will size the capacitors required for you, provide diagram on how to mount the capacitor, and provide the best prices for three phase capacitors in North America. Because of no moving parts, these capacitors last for years under continual use. Our Energy Design Services capacitors are also gas filled with a single stud mount. This means you can mount them anywhere and in any direction with ease and save your customer 5% or more on their electric bill. Despite the fantastic results with our ArtiKool product. Our R&D team is always looking at ways to improve our product performance further in keeping up with the new refrigerant being released. With the ever changing refrigeration's blends, our team knew their was a need to design a new blend to create even a better performance from units treated with ArtiKool. Well, now we have two blends. ArtiKool’s new product designed blend is to make treated system performance improvements even greater. Introducing now ArtiKool Synthetic AK-1 and AK-2. More can be learned about the two on the "ArtiKool Information Downloads" page, found on the side menu. "Today, there are a number of second-generation synthetic refrigeration additives (SRAs) that result in a measurable increase in efficiency (and, as with PROA, a reduction in sound-pressure levels). " Notice to all Master Distributors! Warning! Watch out for this scam! One of our Affiliates had someone try to pull this scam on them. Please all Affiliates go to this website and read about how this scam works. We at EDS, LLC do not want any of our clients to be scammed so we have created this page to warn everyone. Please go to http://www.peterwhitecycles.com/scams.htm to learn more about this scam so you can prevent yourself from being a victim of this rip off scam. We have already had one of our Affiliates have someone try to pull this scam on them and we want to make sure everyone is aware. We offer two blends, AK-1 and AK-2 to cover all refrigeration systems. 2. 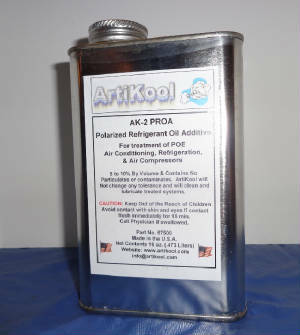 ArtiKool Blue Formula does the same as the AK-1 or AK-2, but with blue UV dye to help locate any possible leaks within the system, available January 2013.